Phileen Jones shed some tears as she thought of the little girl who left her. But for a foster parent, doing what's right can mean doing what's hard. Her eyes a little moist, Mrs. Jones, 49, of Santa Barbara, explained she couldn't care for both the girl and her brother, but both siblings are together and headed to a foster family who could eventually adopt them. Mrs. Jones talked about that Wednesday just before she joined an estimated 250 people who carried photo cutouts of foster children down State Street to the steady beat of a drum. Cheri Diaz, who has taken care of a total of 25 foster children and has adopted four of them, now ages 2 to 10, listened to her and gave her some verbal support. "It's painful because you invested in their lives," Mrs. Diaz said about foster children leaving a home. "But it's also exhilarating to know they're in a home and knowing you've met their needs." It's not easy being a foster parent, the Santa Barbara resident said. "No kidding, running a simple errand can take five hours. All the foster kids have to have a medical exam in 30 days. "It's a challenge, but it's the most rewarding challenge I've had in my life," she said. 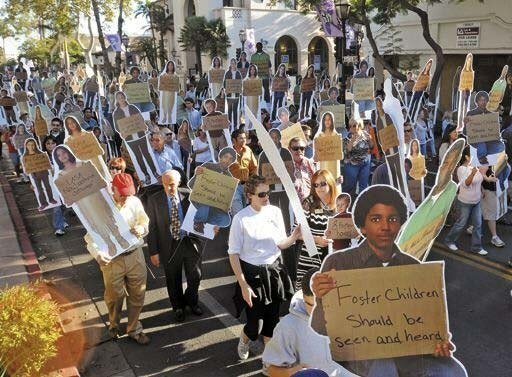 The Forgotten Children's March went from De la Guerra Plaza to the Courthouse Sunken Garden, where the cutouts on the move joined 450 cutouts already in the ground. 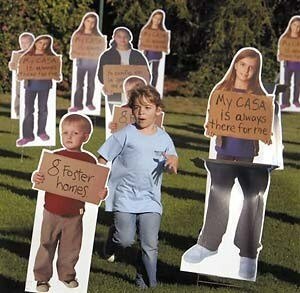 The 850 cutouts were meant to represent the number of foster children who enter the nation's foster-care system each day, according to Court Appointed Special Advocates, or CASA, which organized the walk. At the Courthouse Sunken Garden, Kenny and Crosby Loggins were on the bill for entertainment at a community fair, and awards were presented to those who have supported CASA's efforts for foster children. The cutouts in the traveling exhibit featured the children carrying signs that said things such as, "Foster children should be seen and heard." And that was the point of the march, said Maria Long, executive director of the Santa Barbara chapter of CASA. The organization's advocates represent and help the same foster child until he or she is adopted or becomes an adult. "What a lot of people don't know is there are over 700 children in Santa Barbara County in foster care," Ms. Long said during an interview at De la Guerra Plaza. "Because of confidentiality, they are often unseen." "We are the first of 900 CASAs to receive this (photo cutout) exhibit," said Ms. Long, who was at the Washington Monument for the exhibit. Foster children in the worst situations have CASA advocates helping them, but many foster children don't have that advantage and need to be remembered by the community, said Marilyn Hart, a CASA advocate from Santa Ynez who came to the march. It's not easy being a foster child, said another CASA advocate, Cecily Hintzen, 50, of Santa Barbara. "They're moved from placement to placement and are asked to give up a lot. Their whole lives are turned upside down, as they move away from their friends and families." Mrs. Jones said it's difficult to let foster children go, but during the walk, her tearful eyes had given way to a big smile. "It's great to see so many people. There's a lot of business people here; these men and women work, and they're giving a little bit of their time," she said as she walked with the big group of people and photo cutouts around her. Spectators watched along State Street as police and a drummer led the march. As the march began back in De la Guerra Plaza, Marika Bookin, 52, of Goleta, who has been a foster parent, walked with a group of men, women and children in light blue T-shirts with a photo of a baby on their backs. They were promoting Angels Foster Care, an organization that helps to find placements for foster children, ages infant to 3. "It's very important these children have a safe home where they feel loved," she said, walking to the beat of the march's drum.